All Terrain Tires: Pure traction, increased tread, and impact resistance are offered with the all-terrain tires that allow you to travel over the any terrain. 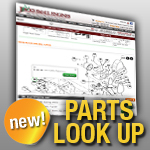 Perfect for ATVs, riding mowers, tillers, and more. Check out our selection below!